Enter your information to receive our comprehensive explosive growth strategies series. Customer Driven Reviews & Feedback Which credit card processing company is best for YOU? eWay uses the tagline “Payments Made Easy” because that is what they do. The eWay payment gateway connects websites with merchant accounts to make credit card processing easy and simple for online merchants. 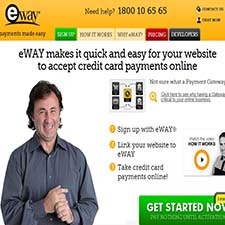 eWay is an Australian based payment gateway that provides service to over 12,000 merchants. In addition to providing merchant services for Australian businesses, they can also offer payment gateways for businesses located in New Zealand and the United Kingdom. With no contracts, a 30 day money back guarantee and transactions that start as low as $0.22 each, they are a cost effective solution for online merchants looking for a safe and reliable method to accept credit cards. In addition to the cost effectiveness of eWay, merchants also appreciate the dedicated local customer service. Local customer service agents can help merchants with any type of question from choosing the best shopping cart to setting up a merchant account with your chosen bank. And when it comes to security, eWay is using the same state of the art technology that the big banks use to keep financial data and transactions secure. From fraud prevention to heavy encryption of card numbers on bank grade servers, there are multiple layers of security keeping you and your customers safe. With a huge array of available products and pricing plans for small businesses doing dozens of transactions up to large companies doing thousands of transactions daily, eWay can provide a suitable solution to any online payment needs. They make it so easy to get started that you can open an account and go live within 60 minutes. RateCreditCardProcessing.com - Real customer reviews and feedback, helping business accept credit card payments with less cost and less time. Please fill in the form below to request FREE access to you in 10 minutes time.